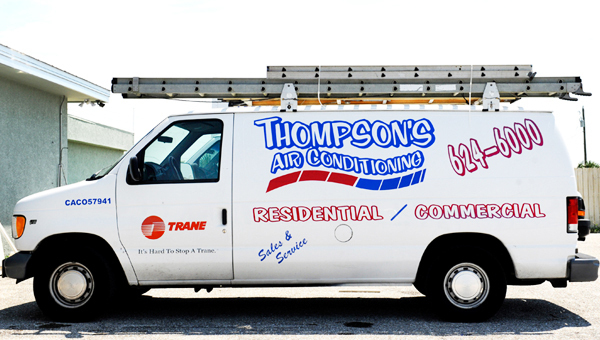 Thompson’s Air Conditioning, Inc. has been serving the Charlotte County area for over 10 years, and bring over 30 years of experience with our knowledgeable staff. We are licensed and insured, and provide after hour emergency service to our customers. All of our technicians have been trained in every area of service, so they can provide our customers with efficient service. Although our customers may not meet our production staff, they can be assured that their system was installed by a well trained team, who take pride in every job they do. When calling our office, you will be greeted by a friendly person, not an automated system. Our professional customer service staff will help our customers get speedy attention to their needs. The job went great. It was an emergency call. The air conditioning was not working. It was neither heating nor cooling. They came out a few hours later the same day. The service technician was very professional and he thoroughly checked out the air conditioner. He showed me what I could do next time it happens. Overall it went very well and it only took him an hour. I had an a/c unit that was turning on. Called at 9am with no appointment and they had someone there by Noon. Found the simply problem and fixed it in a very timely manner. Member Comments: Tech was extremely nice and professional. Performed the work quickly and properly. I got exactly what I had hoped for by using them based on the other reports I had read. The job required dismantling and removal of existing ductwork, furnace,and outside ac unit. Install all new energy efficient equipment. Member Comments: Tim Thompson, the owner, came to my house to look at the job. We discussed different options and prices and the pros and cons of each. I felt comfortable with his recommendations. He is a hands on owner, and does a lot of the work himself. He also has qualified, friendly personnel working with him. It was a pleasure working with him and his crew. I used them to install an air conditioning unit for me. I have used them now for eight years. Member Comments: You won’t be disappointed with Thompson’s! They show up on time to do the work and have a very well run organization. I will continue to use them for future service. On call technicians are available after hours. Please call the office line in case of an emergency. Thompson Air Conditioning All rights reserved.